As 2013 is slowly drawing to a close ARM has been tantalizing us with the prospects for 2014. One of the biggest changes to mobile computing will take place next year, with the advent of 64-bit ARM based processors. Although Intel does have a slight lead in bringing 64 bit computing to Android, the real benefits will come when ARM releases its Cortex-A57 and Cortex-A53 processors. The move to 64-bit means two things for ARM, first it means it can offer processors with an up to 50% performance improvement over existing 32-bit Cortex-A15 processors. Second it means that ARM can force its way into the server room. 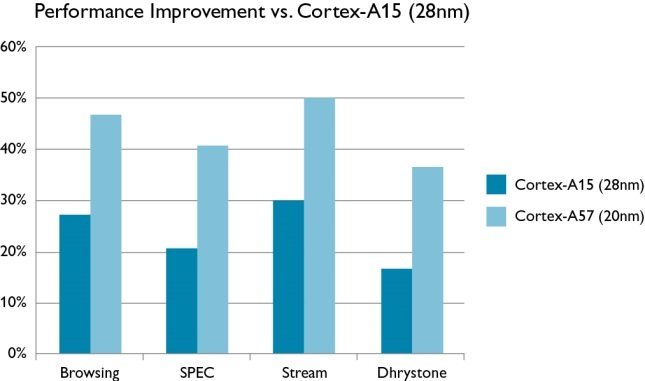 The Cortex-A57 and Cortex-A53 processors are designed to be used in a similar way to the current Cortex-A7 and Cortex-A15 processors and can be joined together in a big.LITTLE configuration, think Exynos 5420 but with 64-bits. But the real magic behind the Cortex-50 series is that they are backwards compatible and can run existing 32-bit applications ARMv7 applications. However when in 64-bit mode the Cortex-A50 series processors offer increased performance due to the its 64-bit features which include 64-bit general purpose registers, that increase performance and reduces stack use; 64k pages, that reduce page miss rates and reduce the depth of page walks; and double precision floating point SIMDs, which will be mainly useful in High Performance Computing (HPC) setups. It isn’t yet known which version of Android will be fully 64-bit compatible, it is unlikely to be Android 4.4 KitKat but hopefully Android 5.0 will be able to fully utilize the new ARMv8 architecture. However the transition to 64-bits shouldn’t be too hard as Linux has supported 64-bit modes on Intel for a long time and earlier this year support for ARM64 started to appear in the mainline kernel. The other interesting prospect for 2014 is devices with 4GB of RAM (or more). The Samsung Galaxy Note 3 already has 3GB of memory and the jumps from 1GB to 2GB to 3GB haven’t been that hard. Of course there is a valid argument against such large amounts of memory in a mobile device, however Samsung’s clever multi-windows software demonstrates that true multi-tasking is possible on a handheld device and with true multi-tasking comes the need for more memory. Likewise the increasing complexity of 3D games on Android also demonstrates the need for more memory, this time for use by the 3D subsystems. To put this into context, there are many a good PC or laptop running Windows today that only have 2GB of memory and there are a multitude of graphics cards with memory measured in Gigabytes and not just Megabytes. The advent of smartphones and tablets with such large resources underlines where consumers are expecting to find their computing power. How does this all sound to you, do you like the idea of a 64-bit Android device with 4GB of RAM?